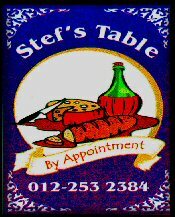 Stef's Table Restaurant and Tea garden is situated at 73 Scott Street, the main road towards and from the tunnel in the picturesque suburb of Schoemansville, Hartbeespoort. We cater for intimate dinners, small birthday parties and small corporate functions. (maximum seating 20 people). Business hours are from 19:00 to 23:00 Tuesday evenings to Sunday Lunch and reservation is essential. The tea garden is open from 11:00 to 15:00 on Wednesdays. Fridays to Sundays. Our tastefully furnished double guest room with its own private entrance and garden has an en suite bathroom, television, coffee and tea making facilities and small fridge. The package includes breakfast served in the restaurant or in the room if you so wish. Dinner, bed and breakfast packages also available. We are fully licensed and do not allow children under the age of 12.